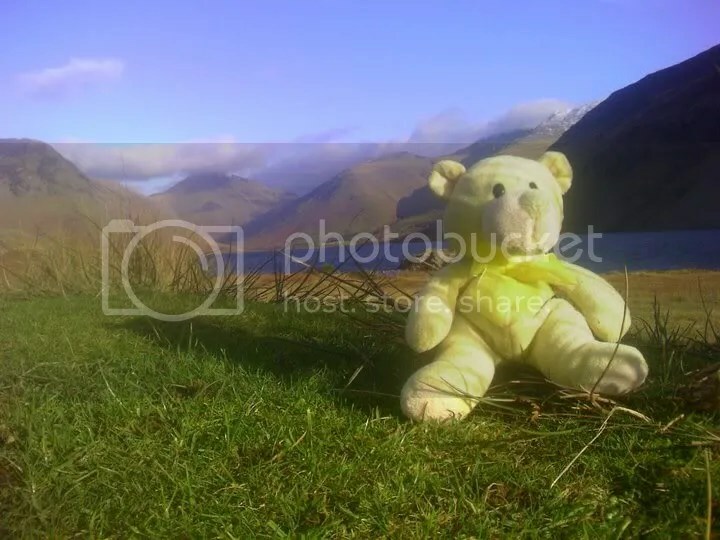 Here I am at the top of the warning sign at the entry to Wrynose Pass! I worry because because surely 1 in 3 is 33% … isn’t it? I mean I’m no mathematician, I’m just a small bear but if they can’t get simple maths correct what else could they have got wrong … eek! 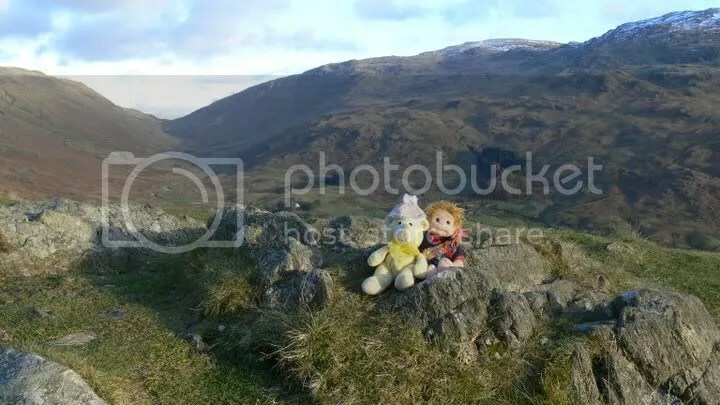 And here I am high up on Wrynose Pass and on Cockley Bridge at the junction between Wrynose and Hardknott Passes. 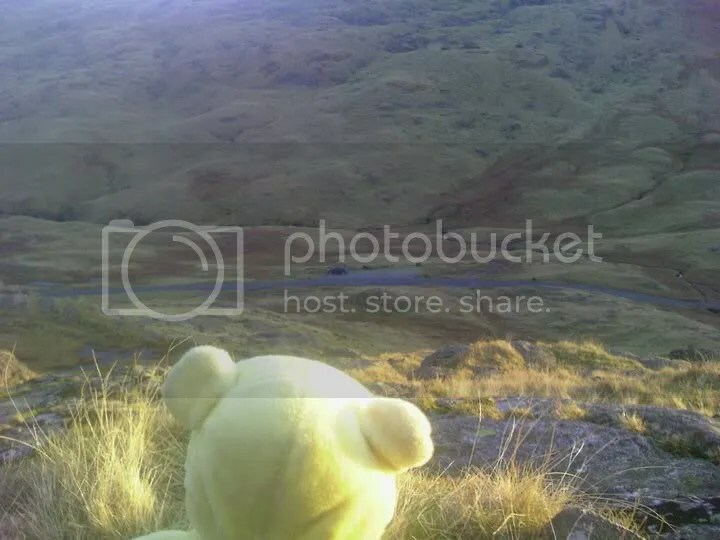 Ben has been looking at the road up Hardknott Pass from down the valley and is concerned it looks REALLY steep. Now Ben is quite cavalier about these things so it disturbs me that he appears apprehensive. 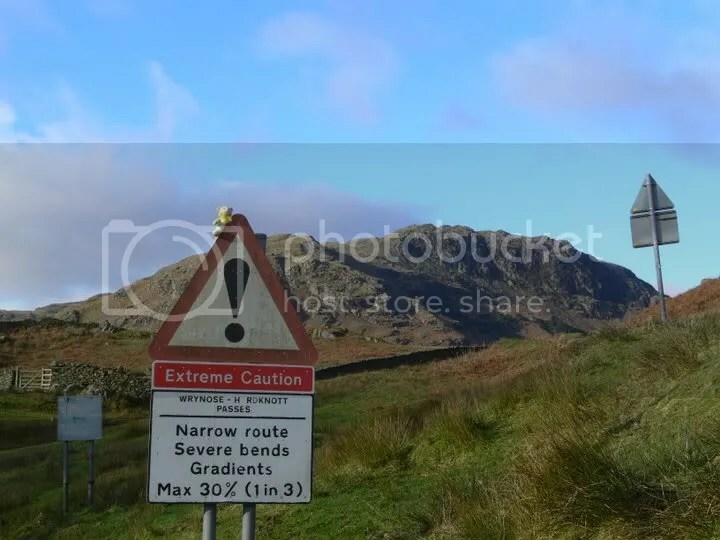 Ooh here’s another collection of signs warning of impending doom! Now at this point I should say that there are no photos actually from Hardknott Pass at this point in time. 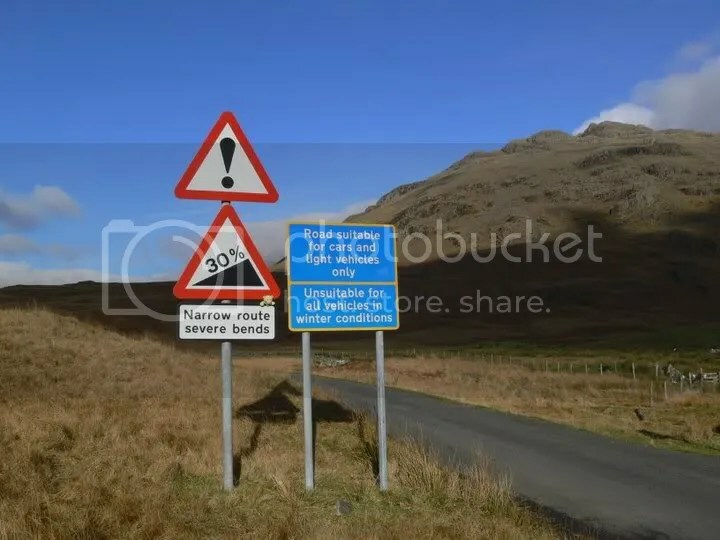 When we got almost to the top we hit a patch of thick black ice and all 4 wheels on the Astra started sliding backwards toward the edge of the road. We all decided it was too dangerous to carry on and Ben managed somehow to turn the car round and go back down. Eddi got the map out and we found another route to try and tackle Hardknott from the other direction. Happily the scenery we found along the way was awesome. Eventually we get to Wast Water which is really beautiful. It’s the deepest lake in England you know? After stopping at the pub at Wasdale Head for a cup of tea we head of back towards Hardknott Pass and this time we make it. Yay! Here’s me and Chipper at the very top. It’s very, very cold… look at the snow on the mountains. You can see the road back down the valley we travelled in the morning in Wrynose Bottom. We drive a little further… all the way down that road you can see in the photo above and up over the hill at the end and stop for sandwiches and then I take Ben climbing. Its a natural bear instinct. Chipper says he’s not going, even though he’s got a woolly hat and coat. So he and Eddi stay in the car and wait for us to come back. It’s getting cold by now and it’ll get dark soon so B&E decide we should head for the cottage. What a wonderful day we’ve all had. I wonder where we’ll go on Thursday?